Deuel County was named after Jacob S. Deuel in the year 1862 and is composed of sixteen townships. The smallest being Antelope Valley which was named that on account of the many antelope there at that time. Most of the other townships were names after some man or place. It is about 30 miles long and 21 miles wide. It is bounded on the north by Grant County, south by Brookings County, on the west by Codington and Hamlin Counties, and on the east by Minnesota State Line. It used to be in a territory and took in most of what is North and South Dakota now and part of Nebraska. It was declared a state in the spring of the year of 1889. As far as I know most of the early settlers came in the seventies. My father came in the spring of 1879 to take up his claim where my brother and sister still live. He built a little claim shanty 16' x 24' sitting on large rocks for a foundation, put up a sod barn, dug a well by hand, broke up some land and went back to Minnesota for the winter. Next spring bringing his wife and two small daughters back to the wilderness S. E. of Goodwin. 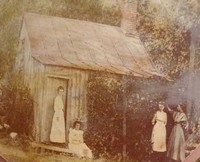 This claim shanty with two small addition added later, was our home until 1908 when we built the new house. Mother brought a tiny sapling of a cotton wood tree in her trunk which her father had given her. She set it out and it got to be a huge tree in years to come. Lightening struck it, ice and wind broke it and it died from drought in the 30's. Mother's brother gave her a cow which she brought in the immigration car. She was named Vim and raised 19 calves and all were heifers. Father felt she had paid her way so kept her till she died of old age. At the time my father came there were still a few buffalo and antelope and Indians. The Sioux Indians were at peace then but still use their trails across the prairie, and the rings of stone still lay where they had weighted down the flaps of their teepees. The buffalo rings still plainly showed where the bulls had stood stomping flies, with their heads to the outside, to protect the cows and calves which were in the inside of the ring, from the wolves and coyotes which were many in those days. I still can remember the chilling howl of them in the dusk of the evening. The bleached intact skeletons of the buffalo still lay on the prairie and folks would gather the horns and make many beautiful things from them. Deuel County has several creeks and about 15 large lakes and some smaller ones. Lake Alice is the largest and lies N. E. of Altamont and covers 1100 acres. It was named after John Marher's daughter Alice. Coteau Lake lies west of Altamont and is often called Altamont Lake or Goddard's lake as Mr. Goddard was one of the first settlers and had to drive to Marshall for supplies as there were no nearer towns. The Lake was named after the Coteau Hills which were called Coteau des Prairie. the main street of Gary was named after them and are a string of hills running thru the east central part of the county. The only song I had published was written about them, "When the Sunset Turns the Coteau Hills to Gold." North of Goodwin there are a chain of lakes consisting of Round Lake, School Lake, Two Woods and Mud lake. It was between two of these lakes that the 39 Indians were captured during the Indian massacre and were later hung from a railroad bridge near Mankato, Minn. The largest hanging in history. Helen Hogie's great uncle helped in the capture. Goodwin lies near the old Indian grounds and many Indian hammers and arrow heads have been found. Clear Lake was named after the county seat or rather the town named after it and lies just east of there. Lake Cochrane lies six miles south of Gary and was named after Byron Cochrane who settled on it's shore in1872. Fish Lake is N. E. of Astoria. This lake went dry during the drought during the 30's, as did Clear Lake, Lake Alice and others except Lake Cochran which is fed by springs. Lake Francis is four miles N. W. of Gary and was named after the oldest child of Henry Herrick, who was an early resident of Gary and who our township is named after. Lone Tree Lake was so named as one lone tree grew on its banks in early years, but now there are many. Salt Lake lies S. E. of Revillo and is different from the rest as the shores are of a reddish hue and when the water evaporates it is white resembling salt. Our county has eight towns. Gary is the oldest. Most of them named after some person. Goodwin was named after a railroad official George Pl Goodwin who was afterwards killed in 1878 while he was helping build the railroad and his widow asked to have the town named after him. Now since the Chicago N.W. railroad tracks have been torn up, Altamont and Goodwin are soon to become ghost towns. At that time the railroad only ran to Gary from the east as it does now, after 82 years. Goodwin has the highest altitude of the towns which is 1996 feet and Gary the lowest, which is 1784 feet, making an elevation of 212 feet in th 18 miles. Little wonder that the fireman on the freight train at Gary said it was 18 miles strait up to Goodwin. The other towns are Astoria, Bemis, Brandt, Mortz and Toronto. The town of Bemis use to be called Burnham and then Palmer and later named after one of the towns citizens, Mr. Bemis. Clear Lake was started in the early 80's and my father use to sell buckwheat flour to the railroad crew when building the track. He got the buckw3heat ground at the mill in Watertown, which was a long day trip by team. Our Country use to be wild prairie, covered with wild game and flower, but now man has changed all that in his greed for more land, and breaking up the sod. So many birds have gone especially the prairie chicken, which used to be so plentiful and now we see none. There were lots of hardships in those pioneer days with our prairie fires and blizzards in winter. We saw hard times but had lots to be thankful for. Deuel county has always been my home, I was born here, married here, and raise my family here. Most of my dear ones who have gone are buried here and I suppose I will die here. I think Deuel County is a little spot of heaven.